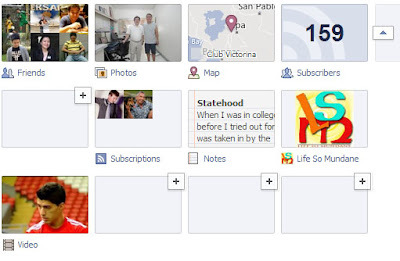 Before Facebook introduced the Timeline, the tabs feature was actually already being used in the old Wall. This was the folder leaf feature that enabled users to see specific applications quickly from within the profile page. In the Timeline version of Facebook, the tabs appear as rectangural boxes underneath the cover picture. These tabs can be expanded as will be shown later in this tutorial. Using the tabs has a dual purpose. From the user’s point of view, the tab can be used to navigate from one Facebook application or another, e.g. Photos, Videos, Notes, etc. The tabs are also visible to visitors to or viewers of your profile; so through these tabs you tell more of your friends about who and what you are. Facebook by default places your most used applications into these tabs: Photos, Videos, Notes and others. Click on the inverted arrowhead to the right of the row of tabs to expand the application and show all your tabs. Facebook will drop down a menu of applications available for use in tabs. Your list may be longer than the picture below if you have not tabbed any applications yet. 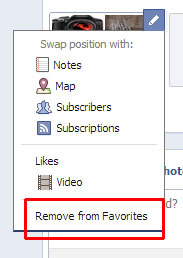 Simply click on the application of your choice to add to a tab or add to Favorites, as Facebook prefers to call it. For the purposes of this tutorial, I have opted to tab my Likes, as show in the graphic below. Note that the option Likes is highlighted in blue. Clicking the icon brings down a menu of choices that will allow you to switch the positioning of your tabs or remove the tab altogether. Click on Remove from Favorites to remove the tab. You’e done! That’s all there is to it!